Zhou was graduated from the Sichuan Academy of Fine Art in 2002 and specialized in oil painting. After graduation, the young artist moved to Beijing and started her career in oil painting. 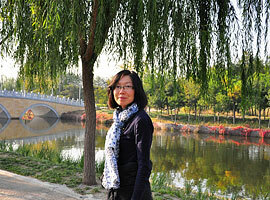 Beijing, the capital of China is no doubt, a big attraction for Zhou to share a piece of the action as an artist. Zhou is particularly fond of trendy objects in the commercial sector. To Zhou, the world is full of colors and dreams. The material world is a fantasy or a dream to many people, but it is in Zhou’s paintings that the dream has become reality.